Network Transportation is a growing trucking company that is currently serving the Southwest, but is also rapidly expanding their service area to reach across the country as well. 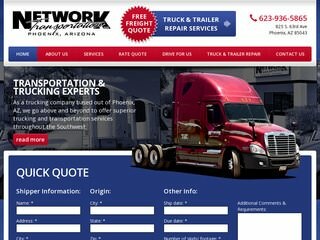 They came to us interested in trucking website design that would give their growing business a presence on the Internet and help them meet several goals. We developed an inclusive website that allows the company to present itself as an established company in the trucking industry, simplifies the quote request process for clients, and allows new drivers to apply online.